A consolidated group of militants, the Joint Revolutionary Council (JRC), yesterday, vowed to riddle Bayelsa State Government House with bullets if Governor Seriake Dickson continued to owe workers their salaries. The group said it was unacceptable for Dickson to be owing civil servants about seven months, local government workers for over 13 months, pensioners for about nine months and workers in the only state university, Niger Delta University (NDU) for about seven months. The group in a statement said after its meeting in Yenagoa, it also resolved to attack more flow stations to express its displeasure in the inability of the Federal Government to address the challenges confronting the Niger Delta region. Persons who endorsed the statement for the group identified themselves as ‘General’ Torunanaowei Latei (Creek Network Coordinator); ‘General’ Agbakakuro Owei-Tauro (Pipeline Bleeding Expert); ‘General’ Akotebe Darikoro (Commander, General Duties) and ‘General’ Pulokiri Ebikade (Intelligence Bureau). The group said: “We are warning Governor Henry Seriake Dickson of Bayelsa state, without further delay commence the final payment of all workers including the old pensioners been owed their several months of salary. Dickson is to pay these workers/pensioners in full and not 50% or half of half of their legitimate salaries. fund but the government is busy doing projects and building personal buildings within and outside the state, while these workers are dying in abject poverty in the state. “This is unacceptable and it must stop forthwith in the region because our parents, brothers and sisters are not to suffer as a result of their effort in government. “Enough is enough, he should go and bring the money wherever he is keeping it and fully pay these workers and pensioners before the end of this month or otherwise, what he is looking for in the state he shall see it from us”. Accusing the government and its family of diverting public money for personal projects, the group claimed that the ministry of works of paying all supply contracts to governor’s relatives while ignoring others. outside Bayelsa now to pay the workers immediately. “We’ll go after any of Dickson’s relation and political appointees who have given wrong advise to the Pharaoh (Gov. 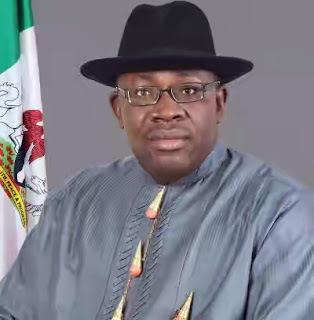 Dickson) of Bayelsa state to cripple the state. avoiding bloodshed. Whoever that attacks us in words will also go for it. “If Dickson undermines us what he saw while serving as Attorney General and Commissioner for Justice of the state on that fateful day of April, 27th 2007 were we came and sacked President Goodluck Jonathan then governor of the state at government house, will experience same but this time around it will be disastrous and head will roll, whoever that confronts us”. On attack on oil attacks on oil installation the militant group named its targets as the oil and gas pipelines running from Ogboinbiri in Southern Ijaw LGA of Bayelsa state to Obrinkon in Ikwerre LGA of Rivers state. Other it planned to attack are the flow stations of Ogboinbiri, Oporoma, Peremabiri, Tabidaba, Nembe, Brass, Chevron platform in Koluama, Okordia-Zarama and Biseni including Gbarain-Ubie gas gathering plant. It said they would be be set ablaze because the oil companies were major hindrances to the development of the region. The group warned persons staying within its targets to leave insisting that its mission was to cripple the economy of the country and not to kill anybody. “The Nigerian securities who are claiming they are securing the oil facilities in the region should stay as their dwelling places and see whether their safety will be guarantee by the music on those days. “We thanked the Minister of state, Petroleum Resources for the bold steps he personally took to resolve the injustice created and sponsored by the wicked companies and government in Nigeria. Our struggle is beyond monetary gains and we cannot be bribe by the Nigerian government to the detriment of our suffering people and the struggle is unstoppable until justice is done to the region. on standby in Rivers, Akwa-Ibom, Edo, Delta Cross River await after Bayelsa state operations. “We further warned that, henceforth, any attack on Ijaw communities or person(s) by the military or para-military body in the region, we will not hesitate to order our shoot-at-sight squad of any uniform personnel in the region. “For the records, Niger Delta Avengers (NDA) are not in Delta state, we only go there to strike and returns back safely to the struggle base, Bayelsa state”.